Steve G. had ScanMyPhotos.com digitally preserve his family's most precious memories. It all started with a photo booth and a kiss - his parent's first picture together was fading away, but managed to be saved and is now shared with their whole family. This warmhearted story is repeated every day as ScanMyPhotos.com digitally saves millions of pictures, but none with more emotion or sentimental love than this one. Scanning is only half the magic. Once your pictures are digitized, consider having it professionally restored, colorized and more [click here for more info]. But, there is more. Once your pictures are organized, then you can design extraordinary custom photo memory books, collage scrapbooking pages. You choose the design, add the photos, caption and customize each picture. Have fun and take as much time as you like. No experience is necessary and our 24/7 Live Support help desk is always accessible. 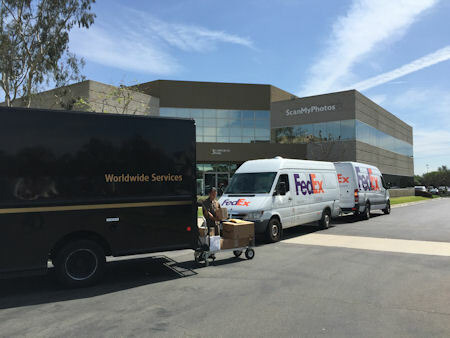 Best part is that your completed photo enlargements and precious photo memories are printed, fulfilled and mailed back to you on the same business day from ScanMyPhotos.com from our southern California headquarters.